Breccia. (Ger. brekan = break; It. = gravel). Volcanic breccia, Anne Port to La Crête. A breccia is a sedimentary rock composed of angular fragments (clasts) of various sizes and composition above 2mm, set in different kinds of matrix. The angularity implies it formed close to its source area and that very little transport and abrasion occurred as, for example, in scree or collapse deposits. The name is also used to describe explosive volcanic pyroclastic deposits - volcanic breccia (agglomerate); broken surfaces of lava flows - autobreccia; and angular fault zone fragments - fault breccia. Mixtures of angular and rounded fragments are termed breccio-conglomerates (Whitten & Brooks, p. 53). In Jersey, there are no sedimentary rock breccias although some parts of the Rozel Conglomerate Formation contain mixtures of angular pebbles. Hence, no deposits would seem to have formed very close to their source area. However, there are several volcanic agglomerates in the St. Saviour's Andesite Formation interbedded with various andesites in the Belle Hougue Point area from Giffard Bay in the west to Les Rouaux and Vicard Point on the eastern side. These overlie a basal breccio-conglomerate (mixed angular and rounded clasts). 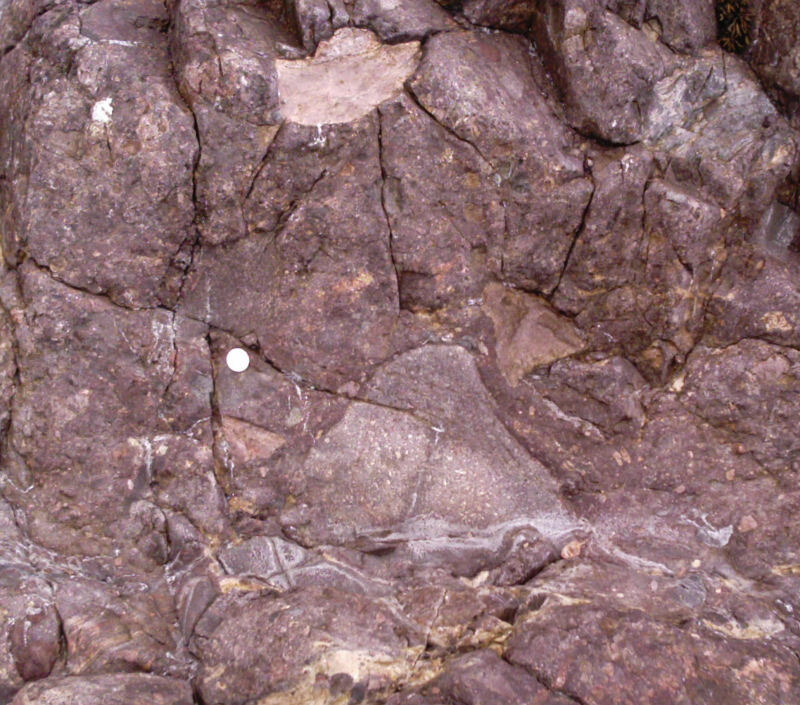 Agglomerates also crop out in the St. Helier Syncline, the outlier immediately west of St. Helier. Volcanic breccias also occur in the Bonne Nuit Ignimbrite with siltstone xenoliths and in the Anne Port Rhyolite (Bouley Rhyolite Formation) between Anne Port Bay and La Crête Point to the north. As one walks from the north side of the bay past the red-brown outcrops of the various rhyolites to La Crête Point, one can sidetrack into different gullies and see agglomerates, autobreccias at the tops of former flows and "rubble" sequences which occur at the base of the flows and which may be described as breccias (Nichols & Hill, 2004. p.19). Fault breccias and crush zones can be seen along some fault zones, for example in the hornfels on the north side of Le Pulec slipway and along the Frémont (L'Homme Mort) Fault at Frémont Point, there is a broad zone of sheared rocks (cataclasite, Bishop & Bisson, 1989, p. 77). Bishop, A. C. & Bisson, G. 1989. Classical areas of British geology: Jersey: description of 1:25,000 Channel Islands Sheet 2. (London: HMSO for British Geological Survey). Nichols, R. A. H. & Hill, A. E., 2004. Jersey Geology Trail. Private publication printed by Charlesworth Grp.